One of the frustrating realities of our credit reporting system is that sometimes questionable items make it into your credit file. When that happens, your credit score can be lowered, and it can result in you not getting the best rates on loans. Depending on the loan amount and the decrease of your score, it is costing you in most cases thousands of dollars. The good news, of course, is that you do have options. Under federal law, you have the right to dispute items on your credit report. If the items are erroneous – cannot be backed-up with supporting documents by the creditors – the credit bureau has to remove them in a timely manner. You can do this yourself, for free, but sometimes it can be rather time-consuming, and you might not know where to begin. This is where a reputable credit repair service can help. One of the credit repair companies available to you is LexingtonLaw.com. The firm has more than 20 years of experience in the realm of consumer credit law, and is headquartered in Salt Lake City, Utah, with offices in all of the lower 48 states. The company has been instrumental in helping more than 1/2 a million people remove millions of negative items from their credit reports. If you don’t feel like you have the time to dispute items on your credit report, contact creditors, or if you need a little guidance, you can get help from Lexington Law for as little as $79.95 per month, after you pay the first-work fee. 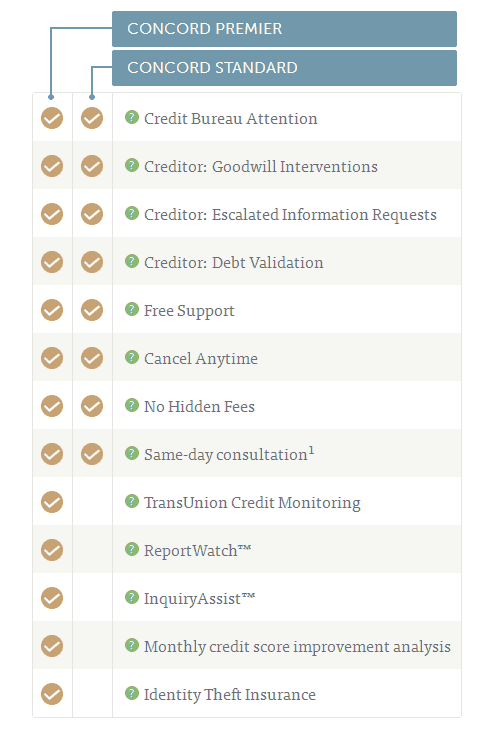 Concord Standard – covers challenging the credit bureaus with dispute letters plus actions that target the creditors such as: good will interventions, escalated information requests and debt validations. Monthly cost for this level is $79.95. Concord Premier – includes everything offered in the Concord Standard level plus powerful services that will increase the efficiency to improve your situation. The additional services are: Transunion credit monitoring, monthly credit score improvement analysis (very powerful feature), report watch (also very powerful), inquiry assist and identity theft insurance. Monthly cost for this level is $99.95. I recommend to start with the powerful Premier level in order to deal in the most efficient way with the “heavy” negative items on your credit report. Once the needed tasks on your new credit situation do not require all the powerful services, you can downgrade to the Standard package. The company makes an effort to work quickly and effectively, contacting the credit bureaus on your behalf to present the case for removing questionable legal items from your report. Like all reputable credit repair companies, they are up front about the fact that you can do this yourself, for free, and in providing the warning that legitimate negative items will not be removed from your credit report. One of the main reasons people choose a credit restoration company is the convenience factor, and this firm makes the process more convenient — and you can enjoy the peace of mind knowing that the service provider knows exactly how your dispute should be approached. Once you sign-up, either by phone or online, you’ll need to send them your credit report from the 3 major credit bureaus, Experian, Equifax and TransUnion. After they receive your credit reports they insert the data to their system. Then, they invite you to log-in to the client area and review the information. Once you’ll log-in, you’ll be able to see all the negative items you have in your reports. Next to each negative record you’ll find options for the way you would like Lexington Law to dispute the item on your behalf. Examples of the options you’ll see are “wrong amount”, “wrong account number”, “I didn’t pay late that month”, “wrong original creditor”, “not mine or not my account” etc’. You’ll need to choose one reason per negative item – pretty easy and simple process. After you are done, they will start to send dispute letters to the credit bureaus. The bureaus will investigate each case and will send you the outcome of their investigation. They will contact creditors and request information as well as debt validation to affirm dispute cases which leads to higher success rate in removing negative records from your report. In a matter of weeks you’ll start to receive updated reports from the bureaus. Make sure you forward the updated reports to your contact person at the company so they can update their records for tracking and preparing the next round of dispute letters on your behalf. They provide more than just paid services; the company also provides credit education that consumers can use to empower themselves. As a client, you can receive coaching from credit experts and paralegals about how to improve your financial and credit situation. Even if you aren’t a client, you can take advantage of a helpful credit maintenance blog they have, as well as find out more about your credit rights, and watch informative webinars (seminars on the web). If you want to know about fixing your credit, this is a good place to start. When you are looking for a credit repair company, you want to choose a service provider that will be up front with you about costs, your rights under the law, and realistic outcomes. The agency provides you with helpful credit insight, and offers straight talk about what can be done in your situation. If you feel overwhelmed about repairing your own credit, Lexington Law is highly recommended. Official website: CLICK HERE to visit LexingtonLaw.com.